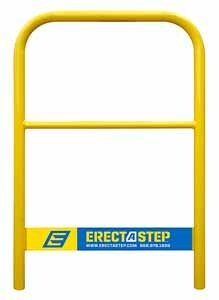 Handrail components make crossover platforms safer through a sturdy tubular aluminum design with no sharp edges and a safety kick plate that keeps things from sliding off the platform deck onto workers or equipment below. Add handrails at all locations where platform deck is open on the sides. Hand rail has an overall height of 48" and measures 32.875" at its widest point. The handrail is finished in Safety Yellow powder coat paint for added visibility and safety. WARNING: This product can expose you to chemicals which are known to the State of California to cause cancer and reproductive harm. For more information – www.p65warnings.ca.gov.